NEW YORK -- Fear drove Wall Street to one of its most dramatic, dizzying days in years Wednesday. Investors fled stocks and poured into bonds as worries about a global economic slowdown intensified. The Dow Jones industrial average dropped 460 points in afternoon trading, all three U.S. stock indexes were in negative territory for the year, and the so-called fear index spiked. A late recovery limited the damage and left stocks mostly lower. 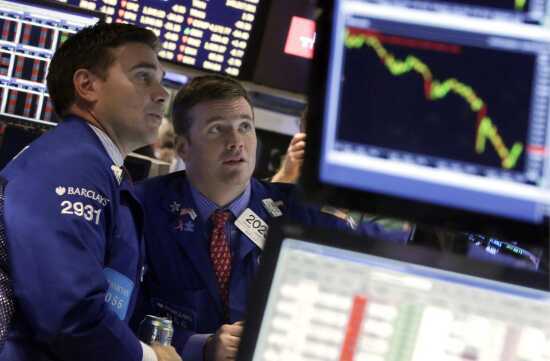 But investors were shaken after the heaviest day of trading in more than three years. "I think it's fair to call it a global growth scare right now," said Bill Stone, chief investment strategist at PNC Asset Management. Investor concerns of a worldwide economic slowdown turned into outright fear after weeks of turbulence. Germany, Europe's biggest economy, is struggling. China's economy appears to be slowing. A batch of worrisome economic news in the U.S. also fueled the selling. Traders sold riskier investments and moved money into U.S. government bonds, gold and cash. By the end of the day, the Dow Jones industrial average lost 173.45 points, or 1 percent, to 16,141.74. The Standard & Poor's 500 index fell 15.21 points, or 0.8 percent, to 1,862.49 and the Nasdaq composite dropped 11.85 points, or 0.3 percent, to 4,215.32. The relatively modest declines, however, masked what was frightening ride for investors. At one point, the Nasdaq flirted with a correction, which happens when a benchmark index closes 10 percent or more below a recent peak. Wall Street's so-called "fear index" also kept rising. The Chicago Board Options Exchange's volatility index, known as the VIX, has more than doubled over the past month: from 12 in September to 26 on Wednesday. Government bonds also reflected deep anxiety among investors. The yield on the benchmark U.S. 10-year note slumped from 2.20 percent to below 1.91 percent in early trading Wednesday, a move of 29 basis points. As bond prices rise, yields drop. "It typically takes weeks for 10-year Treasurys to move 29 basis points," or 0.29 percentage points, noted Tom di Galoma, head of fixed income rates in New York at ED&F Man Capital. "Today it moved 29 basis points in 5 minutes." By the end of the day, the 10-year pulled back to a yield of 2.14 percent. Stone said he thought the plunge in bond yields likely played a role in the stock market's steep drop in early trading. "I don't care who you are: to see the 10-year near 2 percent is shocking," he said. Investors have grown nervous of a stock market that had pushed ever higher, even in the face of a weakening global economy. The U.S. market also has not had a correction in more than three years. Historically a correction happens every 18 months. The S&P 500 index is now 7.4 percent below the peak of 2,011.36 it reached Sept. 18. It would have to close at 1,810.22 or lower to mark a correction. Wednesday's slide brings the market closer to that long-predicted but elusive point. Michael Binger, senior portfolio manager at Gradient Investments, said investors may have started to step back into the market in the last hour of trading as the S&P 500 approached a drop of close to 10 percent from its record close of Sept. 18. "The market has been waiting for this 5 to 10 percent correction for quite some time, and we got it," he said. It's not the U.S. economy that investors are worried about, at least not yet. It's everyone else. Last week markets sold off sharply after the International Monetary Fund cut its economic forecast for the global economy, noting the weakness in Europe and in Asia. The U.S. economy remains in recovery mode. U.S. employers are hiring at the strongest pace in 15 years. The economy expanded at a 4.6 percent annual rate in the April-June quarter and most economists forecast growth will be a healthy 3 percent this year and next. The concern is that the weakness globally will infect the U.S. economy and hurt corporate profits. Companies in the S&P 500 index generate a little less than half their sales outside the U.S. In overseas markets, traders also purged their investments on concerns Europe might relapse into a recession. France's CAC 40 index sank 3.6 percent and Germany's DAX lost 2.9 percent. Britain's FTSE 100 fell 2.8 percent. Investors got discouraging U.S. economic news early Wednesday, when the Commerce Department reported that retail sales declined 0.3 percent in September from the previous month. Purchases of autos, gasoline, furniture and clothing slowed. The Federal Reserve Bank of New York's Empire State Manufacturing index dropped sharply from 27.5 to 6.2 in October as new orders shrank and shipments barely rose. The latest reading marks the slowest pace of growth in six months. Eight out of the 10 sectors in the S&P 500 declined. Financial stocks were the biggest decliners, sliding 2 percent. Financial stocks typically do poorly when investors expect a recession, because more borrowers are likely to default on their loans. Bank of America fell 76 cents, or 4.6 percent, to $15.76. JPMorgan Chase fell $2.46, or 4.2 percent, to $55.53 and Citigroup lost $1.79, or 3.5 percent, $49.68. Homebuilders surged, getting a lift from the slide in the 10-year Treasury bond yield, which affects rates on consumer and business loans. A decline in the 10-year Treasury note yield should nudge mortgage rates lower, spurring home sales. M/I Homes got the biggest boost among the builders, adding 83 cents, or 4 percent, to $20.05. The price of oil continued to fall to new lows Wednesday. Benchmark U.S. crude fell 6 cents to close at $81.78 a barrel on the New York Mercantile Exchange. Brent crude, a benchmark for international oils used by many U.S. refineries, fell 99 cents to close at $83.78 on the ICE Futures exchange in London. Brent is at its lowest level since November of 2010. Wholesale gasoline futures fell 3.1 cents to $2.149 a gallon. In metals trading, gold rose $10.50 to $1,244.80 an ounce, silver rose six cents to $17.46 an ounce and copper fell eight cents to $3.01 a pound. AP Business Writers Steve Rothwell and Matt Craft contributed to this report from New York.